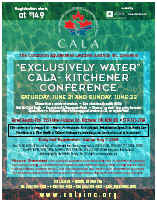 Contact CALA if you would like to be a conference: volunteer, presenter, guest speaker, host, Vendor (booths available). Conferences are open to everyone interested in attending. CALA certification is not required. Check the Upcoming Event page for a list conferences. Plan to attend these "not to be missed" conferences. 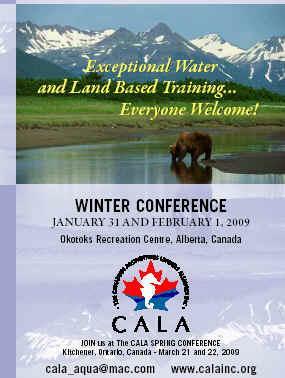 AMAC will be hosting an aqua workshop presented by Charlene Kopansky from Canada. 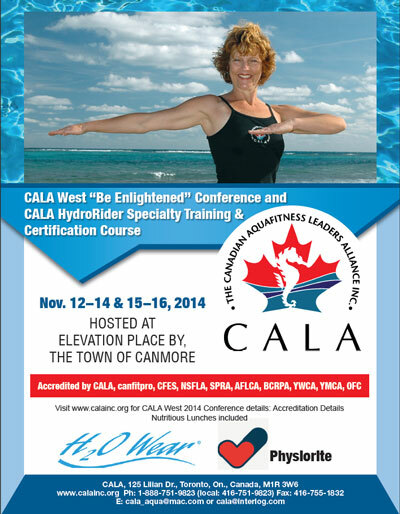 She is the founder of CALA and known all over the world for her pioneering work within water based exercise. She will be delivering 2 workshops on Sunday 20th March 2011 at Beckenham Spa. The titles are ‘Longevity with Vim and Vigour’ & ‘Exploration of Space and Time in Water’. We are extremely lucky for her to fit in a workshop in England as she is currently very busy presenting all over the world and has not been to England since October 2009. 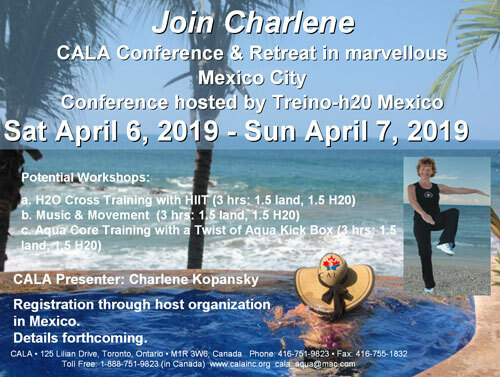 I have been lucky enough to have worked alongside Charlene in the past at an Aqua Conference in England and she is truly an inspirational educator and ambassador for exercise in the water. I want to make sure as many people within the fitness industry are aware of this workshop and have the opportunity to attend. The last workshop she delivered here was not near London and we have chosen a venue which will allow a large amount of instructors easy access to this event. We are currently working on the promotional material for the workshop which will have a photo of Charlene on it. I know she has recently spent some time in Israel taking the CALA qualifications to them and hosts several conferences at different locations around the world. If you look on her web site you will see that there is a very active educational programme across Canada and other parts of the world. I can’t tell you how excited I am to be able to offer instructors in England the opportunity to experience this high standard of education from Charlene for the Aqua industry. Amac training, who I work for, are an educational provider in Kent and therefore always looking at how we can help instructors grow and improve their skills and this workshop is one way to do this for them. As a member of Fitpro myself I know that you will be able to reach so many more instructors than we will alone. f you are interested in joining the conference volunteer team, please contact CALA. The CALA volunteer team goes "the extra mile" to make the event the great success it always is. Our volunteers are multi-talented, acting first and foremost as ambassadors for the CALA organization. There are benefits to volunteering. Contact CALA to discuss the benefits. 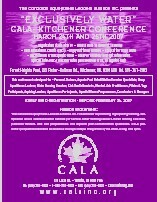 Vendors or individuals who would like to donate prizes for the CALA conference should contact CALA to discuss their contribution. 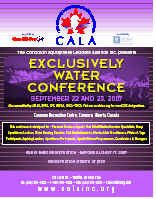 Vendors or individuals who would like to contribute delegate inserts should contact CALA to discuss their contribution. 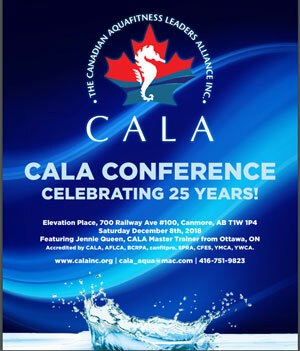 If you would like to be a special guest speaker during breaks, contact CALA. 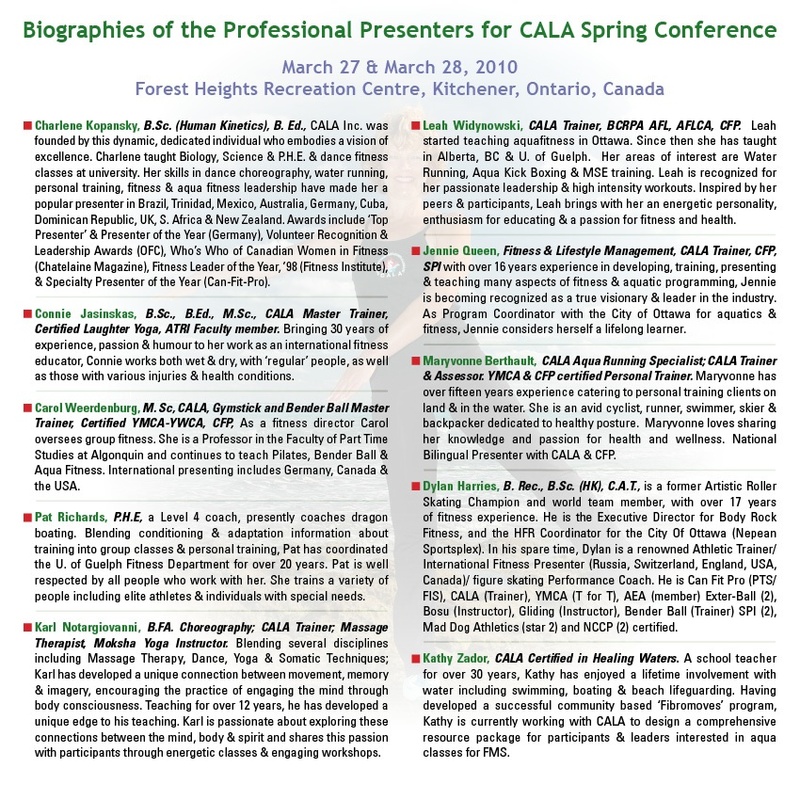 CALA welcomes guest speakers from all fields of fitness such as nutrition, fitness music, stretches, health issues, advancements in Aquafit, employment, business, etc. 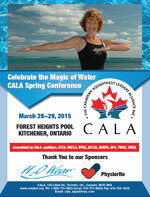 Add some light humour to the conference by performing (musical or acting) for your fellow Aquafit enthusiasts.